Are you inundated with data? Is your data difficult to access and use? Are you able to analyze all the data you collect? Then you might need resources to help with data blending. Data blending is a process that allows the users to quickly get value from multiple data sources by helping them see patterns. Most companies and organizations are collecting as much data in one week as they used to collect in an entire year. Even though companies and organizations are collecting and creating more data, they are unable to use the bulk of it, which is where data blending and data wrangling can help. A leading analyst firm estimates that most companies analyze less than 20% of their data. Why is this? Preparing data and blending large, diverse datasets for analysis is time-consuming, messy and often left to data analysts or data scientists to deal with. For most datasets, data analysts don’t have the right tool and are stuck with applications like Microsoft Excel or similar spreadsheets that were not designed for data wrangling and data blending. This can present a challenge for a data analyst or business user by slowing or stalling the process of analysis. Trifacta provides an entirely new approach to self-service data preparation, data blending and working with diverse data. 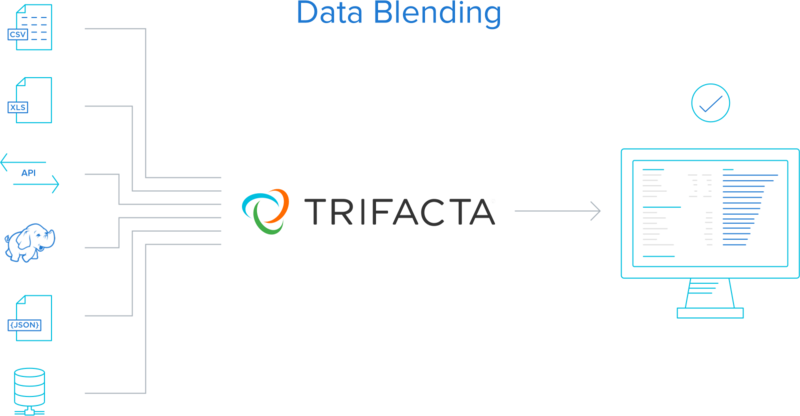 Our data wrangling and data blending solution helps to streamline the cumbersome data preparation process.Trifacta Wrangler was developed to help individuals and organizations to quickly unlock the potential of their data and gain more insights for analysis. Trifacta Wrangle provides a six-step process of discovering, structuring, cleaning, enriching, validating and publishing your data of all shapes and sizes. Trifacta’s head data scientist has outlined six simple steps that will have you thinking about data like a seasoned data scientist. Download our complimentary eBook, Six Core Data Wrangling Activities: An Introductory Guide to Data Wrangling with Trifacta and start wrangling today.